I’m a nerdy list-maker. This should come as a surprise to no one. In addition to all the other reasons I enjoy the end of the year, it’s also when I make my year-end summaries. I did a guestroom wrap-up on my personal blog. I have two bookish wrap-ups to put here. This first one is about library visits. 2009 was the first year I kept track of all my library visits in an orderly fashion. Longtime readers of this blog may remember I did library reviews in 2003. I found I had a difficult time with constructive criticism if I knew the people who worked at a library, so I stopped doing this. 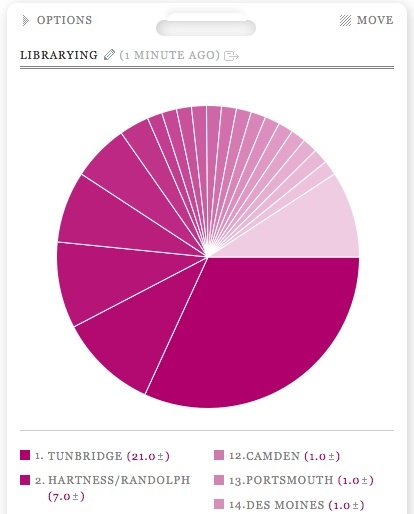 This year I made 67 library visits, about one every five days. A lot of these were for work [either local work or giving talks] and the rest were either fun or curiosity. I used a website called Daytum to track my visits which was really easy. So, here’s a short annotated list of what I was doing in libraries last year. Aldrich/Barre (1) – killing time before dinner with friends in town. The first library in Vermont I did any work for. Austin (1) – LBJ library, sort of a flyby right beore it closed for the day. Cambridge, MA (1) – got to see it after the renovations were done. It’s nice! Des Moines, IA (1) – I helped change their photo policy! Library of Congress (1) – thanks Dan Chudnov for the tour. Westport, MA (1) – my Dad’s library. I’m assuming the Cambridge visit is the public library, and if so you’re missing your visit to Houghton. I’ll try not to take it personally. Actually, Toronto is in ON. Hey Daytum looks pretty interesting. Thanks for the tip. And, according to this morning’s Toronto Star, the TPL now has wifi! TPL has wifi, that’s new, cool!